I make a lot of quilts. Many, most actually, end up being gifts for someone outside my immediate family. Last year, I realized that my daughter didn't have a regular-sized quilt... she's been tagging around the tiny, faded quilt I made for her when I was pregnant. 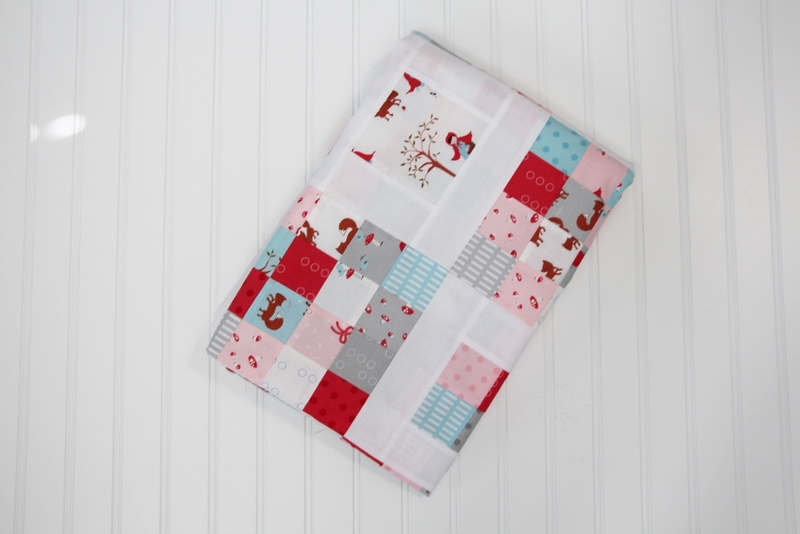 A Walk in the Woods, by Aneela Hoey seemed like the perfect fabric for her. It's pretty, and feminine and whimsical. At a local craft fair, I scooped up a jelly roll and charm pack, and was hoping this was enough to make a creative quilt top. 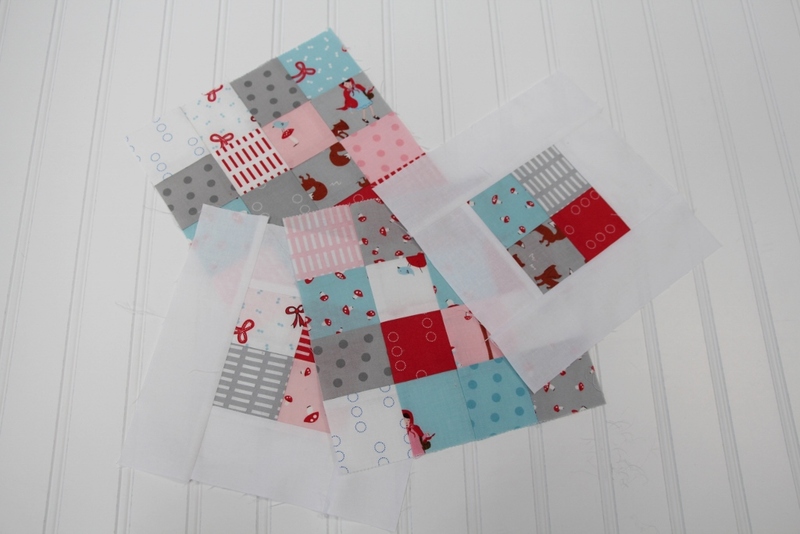 The pattern I selected is called "Four Squared", by Aunt Polly, and can be found in the Moda Bake Shop. The original pattern makes a mid-size quilt, a couple pillows and a bed runner. I found the directions could have used a bit more clarity in describing how much to cut for each element. Otherwise, it was straight-forward. 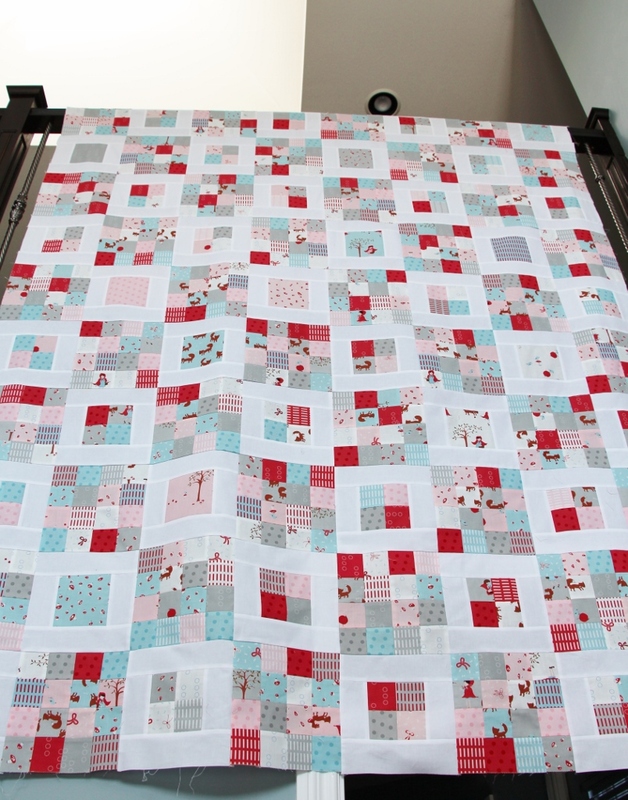 I've altered the pattern layout to use up all the blocks you could possibly make, less four and make it a large quilt. I used 8 blocks across by 10 blocks down. The last four are going to be used for a throw pillow. (She is a huge fan of throw pillows.) This brings the quilt measurements to 64" by 80". This is a surprise quilt. She has no idea I'm making it and it's been tucked away in a box for months, as I plugged away at it. School is out in a couple weeks and I wanted it done before that so I spent a day and powered through to finish it. Miles and miles of chain piecing later, we have a quilt top. Now, it's back in the box while we wait for the backing and binding arrive, and while I plan the quilting. Secret sewing is the best. I can't wait to give it to her! Linking up with Amanda Jean for finish it up Friday, and for Needle and Thread Thursday. pretty! A Walk in the Woods is a favorite ... I've done good job hording mine! Very cute. Love this line. Love it! I adore Aneela Hoey fabric, but I rarely know what to do with it. This design is the perfect solution -- it presents bigger chunks of fabric along with smaller squares. Your quilt does Walk in the Woods justice! Sweet quilt, absolutely the right fabrics for a sweet little girl. Oh wow- I LOVE this. Really nicely done - those little squares are not as easy as they seem to line up everything and you did a great job. Beautiful quilt and fabric this pattern was the first quilt I ever made, I'm very new to patchwork and quilting only started last year.